Paste Thai Massaman curry (Masman curry paste) — a "Muslim" Curry in Thailand, whose name comes from the obsolete "mosalman". Curry paste is a blend of crushed herbs and spices, includes not Thai spices — cardamom, cloves, cinnamon and star anise. 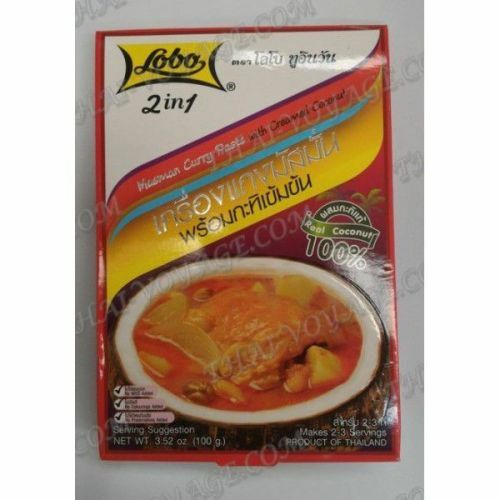 Gradually, this kind of curry made the way in Thailand on the Muslim side. Massaman paste — dark red color. Muslim curry cooked mainly with beef, at least — with duck, chicken or tofu. In addition to meat, Massman Curry add potatoes, Bay leaf, and tree nuts (cashews or peanuts). The package is designed for 2-3 servings. Preparation: preheat 480 ml of water and add the contents of the package. Bring to a boil, add the pieces of beef or chicken. Boil until soft about 10 minutes. Then add the potatoes 2-3 pieces, lightly toasted peanuts or cashews (20-40 g) Cook until the potatoes and the nuts are soft. At the end you can add a little fish sauce to taste. The finished dish is massaman curry served with boiled Thai Jasmine rice loose.